Smith’s next Commencements will be held Sunday, May 19, 2019 and Sunday, May 17, 2020. In order for us to ensure that we pronounce your name correctly during Commencement activities, all seniors will receive an email from NameCoach with a unique link that will allow you to log in and record your name. It is important that you do this in advance to assist us in reading names correctly during the ceremony. If you need technical assistance with NameCoach, please send an email to support@name-coach.com. The Madeleine is published in the fall and a copy will be mailed to graduates at their parent’s home address in mid-October. Additional copies of the book or past books may be purchased through the Office of Student Engagement for $50 each. Seniors who wish to have their portrait included in the book must have their photo taken through Prestige Portraits, per the organization's contract. Senior portrait sessions are scheduled the prior spring for students who will be abroad in the fall, throughout September and October and a final make-up session in February. Students will be contacted by email with dates to sign up, and can contact Prestige directly at 800-426-9533, ext. 169, with questions. The Senior Class panoramic photograph is taken after the Ivy Day and Commencement Rehearsal on Friday morning. 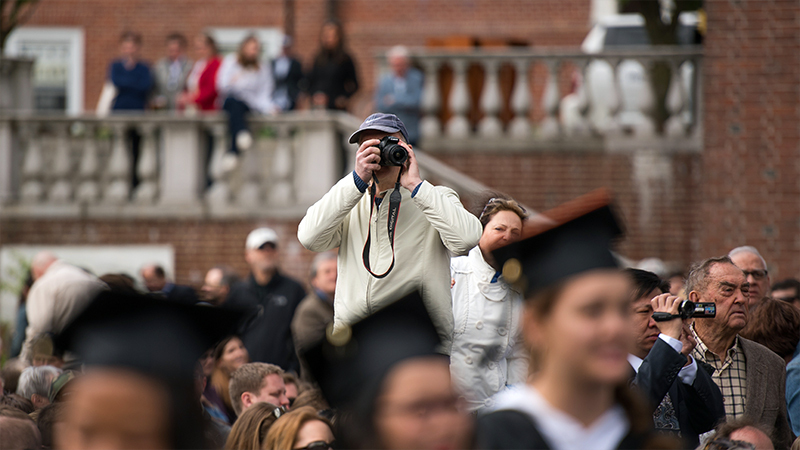 A photographer from GradImages will be at the Commencement ceremony to take candid photographs of each graduate receiving the diploma. Graduates will receive a free passport-sized digital proof of this photo on an order card within 5-7 days following the ceremony. Questions may be emailed to service@gradimages.com. After the ceremony you may order online at www.gradimages.com or call 800-261-2576. Prior to the ceremony: To pre-register your permanent email address, please visit www.gradimages.com and click on Pre-Event Registration. You may add contact information for up to six additional relatives and/or friends. GradImages never has and never will sell or share the address/email information provided to us. The Commencement Group provides Smith graduates, their families and guests the opportunity to purchase bouquets to share with others during Commencement. Flowers may be purchased at the ceremony, at the entrance to the Quadrangle on Paradise Road, or you may place your advance order by visiting the Commencement Group website.